1stBank Center in Broomfield, Colo.
Why have titles? That’s a question the RFA might want to ask itself. It’s not that titles are a bad thing, but the promotion is so proficient at sending its title winners to the UFC that it probably holds the record for most championship affairs contested for vacant title belts. If the RFA doesn’t hold the record already, it might set it soon. And the promotion’s 34th venture adds to the count of vacant titles on the line with its headliner, a welterweight championship clash between Bojan Velickovic and Ben Smith. Smith has been here before. In fact, he might even take issue with the whole RFA-title-equals-UFC-contract theory. 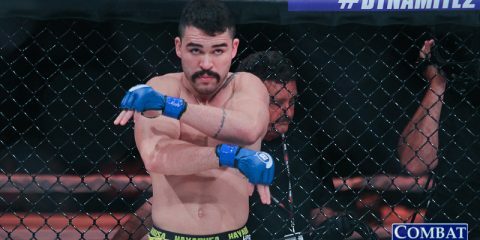 The 18-fight veteran captured the RFA welterweight crown in March 2015 with a TKO stoppage victory over Indalecio Tat Romero. 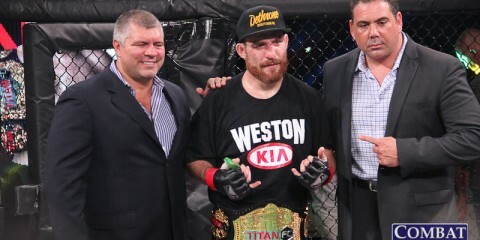 Instead of walking out to the UFC’s Octagon for his next fight, Smith returned to the RFA cage and relinquished his title to UFC veteran Gilbert Smith, who defended it once before converting his RFA championship into a contract with Bellator MMA. Ben Smith, meanwhile, returned to action five months later at RFA 32 and posted a win over formerly undefeated prospect Craig Eckelberg. The Xtreme Couture fighter, who made his pro debut in 2012, only has four wins via strikes and two victories by way of submission. Velickovic has already had one shot at the big show, but he lost his qualifying fight against Tim Williams on The Ultimate Fighter 19. The Serbian entered the TUF competition as an 8-2 middleweight prospect and returned to Europe for a move to welterweight and one more fight after coming up short against Williams. By 2014, though, he was back in the United States fighting under the RFA banner. His move also placed him at American Top Team and Elevation Fight Team. He did lose his RFA debut to the aforementioned Gilbert Smith, but he’s been perfect in his three subsequent RFA outings to earn a shot at the gold. Unlike his opponent, who has won a majority of his fights via decision and lost exclusively by stoppage, Velickovic tends to finish opponents in his wins and lose exclusively on the scorecards. The 27-year-old has seven submission victories and three wins via strikes. Smith draws another tough title fight against a skilled ground fighter, only this time that fighter has a knack for finishing fights too. Smith can employ big slam takedowns in his wrestling arsenal, and his vicious ground-and-pound was on display against the vastly overmatched Romero, but Velickovic is capable of controlling opponents on the mat as well. Smith’s losses are concerning. He has been finished via strikes and submissions, and his struggles came against fighters who would fall in roughly the same level of competition as Velickovic. Meanwhile, Velickovic has found his stride at welterweight. Sure, there’s the loss to Gilbert Smith, but he’s otherwise undefeated in the division. He performed well in his last outing against a high-level wrestler and should continue to turn in strong performances moving forward. This will be a competitive and close bout, but Velickovic’s ability to finish fights is the difference. Ben Smith got caught by Gilbert Smith, and he’ll get caught again by the Serbian. Velickovic will add to his submission victory total and walk away with the RFA gold. It might not take long before the big leagues come calling. The UFC isn’t the only promotion with an important bantamweight title fight on tap this weekend. While the world’s top promotion heads to Boston this weekend, another 135-pound title scrap takes place on the other side of the globe under the Pacific Xtreme Combat banner. PXC’s 51st event features the championship showdown between bantamweight titleholder Kyle Aguon and undefeated challenger Kwan Ho Kwak. With a 9-4 overall mark, Guam’s Aguon might not seem like a big threat, but his record requires a little more exploration. His pro debut in 2008 came against future UFC fighter Jon Delos Reyes, and Aguon won the fight via decision. His next win came in 2010 against future ONE Championship fighter Josh Alvarez. Several fights later, in 2013, he clashed with future UFC fighter Russell Doane and emerged with a split-decision nod. Next, he went a full five rounds in a failed title bid against future UFCer Michinori Tanaka. Meanwhile, his first three losses came against decent competition, but nobody who could be considered a true prospect. In 2014, following the loss to Tanaka in 2013, Aguon put together a three-fight winning streak and claimed the PXC bantamweight crown with a controversial win in the first of back-to-back meetings with Rolando Dy. Both of his fights with Dy ended in split decisions, giving Aguon three career victories by way of a split verdict. Kwak, a Korean Top Team fighter, doesn’t have any notable names on his resume, which may explain how he remains undefeated seven fights into his pro career. The South Korean’s debut came in 2013 against Derrick Rangamar, a common opponent between Kwak and Aguon. Whereas Aguon defeated Rangamar via a choke submission, Kwak topped him via strikes. In fact, Kwak has decimated most of his opponents with his aggressive striking attack. He has only seen the scorecards once and the result was a split decision. He has also lost in amateur action via knockout. Aguon is a real enigma. He has topped fighters who go on to the big leagues, but he loses to fighters who can’t climb above the regional level. This is likely his best chance to woo the UFC brass into adding him to the big promotion’s next event in Southeast Asia. Aguon’s chances at victory here are actually quite good if he can initiate the clinch or, better yet, get Kwak to the ground. Against another common opponent, Trevin Jones, Aguon scored a unanimous decision while Kwak only managed a split verdict. In those fights, Aguon looked more comfortable on the feet against Jones and controlled the action when it went to the canvas. Kwak, meanwhile, was stuck fending off double-leg takedowns after succumbing to one and landing on his back in the opening frame. On the feet, he didn’t settle into a groove. Kwak has been riding a great wave of momentum, but it should all come crashing down in this fight. It will be a closely contested affair, much like a number of Aguon’s bouts, but the titleholder has a knack for handing out losses to prospects. Aguon has the strength, size and length to give Kwak trouble. Furthermore, if the Spike 22 product can close the distance and score takedowns, then he should be able to smother Kwak for long stretches. Asking for a finish out of either competitor might be too optimistic, but Aguon should outwork Kwak en route to the judges’ nod. The heavyweight division is often considered to be a division that lacks depth, so it’s worth paying attention whenever an undefeated prospect comes along. The 40th offering from the Caged Madness fight series from Explosive Fight Promotions puts the spotlight on one such heavyweight, the 4-0 Jeff Hughes. 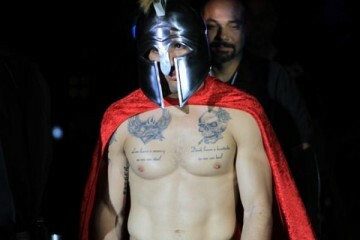 Hughes takes a headlining spot on the card opposite Strikeforce veteran Jason Riley. The 27-year-old Hughes took his time getting to the pro ranks. He fought extensively in the amateur ranks, with a recorded career that began in 2007 and extended all the way into 2013. 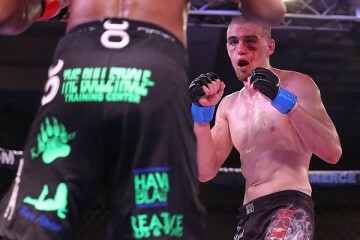 Along the way, he did suffer three losses, but those losses came to future King of the Cage title challenger Nick Gaston, future The Ultimate Fighter 19 cast member and UFC fighter Mike King and undefeated amateur Antwan Phillips. Meanwhile, he claimed 11 amateur victories while mostly fighting for the NAAFS promotion. “Lights Out” finally made his pro debut in 2014, also under the NAAFS banner and made quick work of Devon Wilson. He continued his streak of stoppages into 2015 with two finishes via strikes. His fourth pro victory came against Curt Lemmon, who pushed Hughes to the three-round limit. Riley, who turned pro the same year Hughes hit the amateur circuit, is an interesting opponent for Hughes. This is a man who has appeared in the Strikeforce cage and locked horns with the likes of Tim Sylvia — granted, this came during Sylvia’s nosedive into irrelevance — and Daniel Cormier on Cormier’s way up. Riley lost against both of those notable opponents, and he was also tasted defeat against the likes of Devin Cole and Bobby Brents. The loss to Cormier, which came in 2010, sparked a four-fight skid for Riley before the veteran went inactive in late 2012 and didn’t return until a May 2015 win over Tim Dunn. The Dunn fight marks Riley’s only recent appearance. Riley tends to win by knockout, but he’s also prone to losing fights via strikes. Riley is a towering heavyweight with plenty of experience, but he isn’t exactly the most technical fighter. In this match-up, it might not be a problem. He’s facing a heavyweight who has lost a few fights at the amateur level and hasn’t always looked dominate as a pro. Hughes fights with his hands low and was punished in his sophomore outing before outlasting Leviticus Roberson, who failed to answer the bell for the third round. Hughes may be undefeated, but he’s beatable. Riley holds a size and experience edge over the prospect, and he was once a 6-1 prospect himself. He seems to have a renewed focus since returning in 2015, and his striking arsenal could be the perfect weapon to allow him to hand Hughes the first loss of his young professional career. As long as Riley doesn’t fall victim to the same fate as Roberson, he should win what can be expected to turn into a sloppy brawl between these two Ohio-based heavyweights.